1. Become mindful of your outbursts. 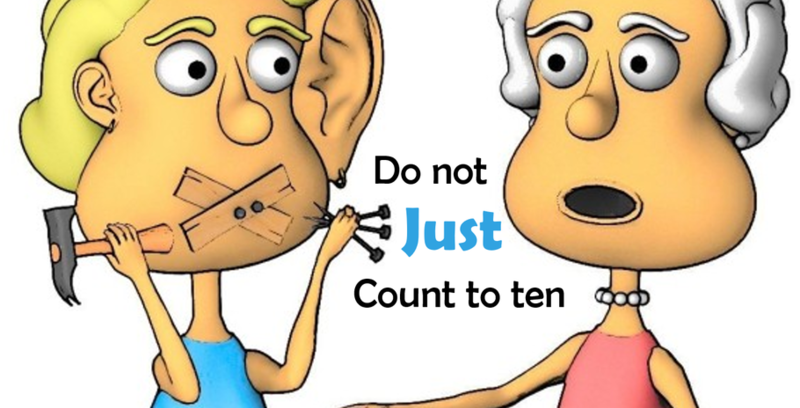 If you have ever been advised to "Learn to count to 10," you are not only prone to frequent outbursts, each outburst becomes a downward spiral of anger that can have only a negative conclusion. If you interpret a current experience as negative, and with the potential to spiral downward, stop right away. In fact, over time, make it a contest within yourself to identify such experiences more quickly. Congratulate yourself when you get to the point of stopping the negative emotion before anyone else notices. 3. Examine any assumption about the negative emotion. It is pretty common to claim that someone else has purposely made you feel angry or sad. But keep in mind Margaret Truman's assertion, "no one can make you feel bad without your permission." So set that assumption aside for a moment. How might this experience be reinterpreted? What trigger are you responding to? In what way have you chosen to respond in a particular way, and therefore how might you choose to respond differently? 5. Cut other people some slack. Can you attribute a positive motive to the other person? At the very least, ask the other person for clarification. 6. Do not take it personally. Even when someone insults you, if you know the insult to be untrue, it cannot hurt you (see #3). You may be able to attribute an unfortunate comment to an ambivalent motive, i.e., the other person is not malevolent, they are simply acting from their own motives and assumptions. 8. Inquire to clarify those motives (see #5). You owe the other person the opportunity to be seen in a positive light. Someone whose ideas lean a different direction from yours provides an opportunity for discussion of those ideas. Unless, of course, one or both of you is inflexible or intransigent; in which case it is a good idea to move the conversation to a new topic. 9. Consider opening your mind. 10. What are my interests? Can I begin to recognize when arguing for my position is a contradiction to my interests? 11. Can I accept that the other person's interests are different from mine? More important, can I accept that those interests are of equal validity and value to the other person as mine are to me? ...that two people can have differing interests yet interact in a way that one set of interests need not take precedence over another, that both sets of interests can be satisfied if only sufficient creativity is applied to potential impasses. 13. Give up the zero sum mentality. Bottom line. When you choose to be happy yourself, you are more likely to contribute to the happiness of others. Which, of course, enhances the possibilities of more positive interactions in the future. Which means we have reversed from a downward spiral to an upward spiral. And as you experience enough of these upwardly oriented interactions, you adopt a positive mindset, expecting that in most circumstances things will turn out in your favor. That positive sense of self emerges then from your subconscious to influence conscious interactions.